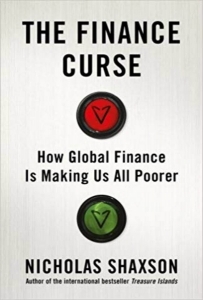 In The Finance Curse: How Global Finance is Making Us All Poorer, Nicholas Shaxsoncharts the devastation caused by the concentration and consolidation of global finance, its ideologies and institutions. Suggesting the need for fundamental reform of business, accounting and finance education, this book exposes global finance as a curse, not a boon, writes Atul K. Shah. Worldwide, millions of people are overwhelmed by finance and its complexity. Simple things like getting a small loan or a mortgage, or even opening a savings account, can have terms and conditions that are complex and confusing, designed to exploit and ‘grab’ the money whilst one is not looking. Many experts in finance, be they economists, finance professors, accountants or lawyers, are too busy profiting from the expertise (knowingly or unknowingly) to experience this pain. Finance buildings and cities look very sophisticated, successful and glamorous. But all that shines is not gold. We know that in economics, there has been a growing student rebellion against its myopic and unrealistic theories and teaching. However, in the fields of accounting and finance, which are equally large and perhaps even larger, no such rebellion is in sight. In the social sciences, there is a growing distance between the academy and the real world, where the evidence of inequality, racism and climate change is opening up gaping holes in the very fabric of our ‘expert’ and specialist theories. A recent study of 40 years of finance research exposes how parochial and self-referential it has become. For Nicholas Shaxson, author of The Finance Curse: How Global Finance is Making Us All Poorer and the bestseller Treasure Islands: How Tax Havens Robbed the World, there is a deep curse shaped by modern finance which needs to be understood and effectively repelled to save society and our ecosystem. The ingredients of this curse include powerful elites, complex financial markets and institutions, extreme greed and capitalism, the economics and finance academy and its theories as well as false narratives like ‘competitiveness’ and ‘light-touch regulation’ as a social good and banking or financial markets as job and wealth creators. Making shareholders the primary focus of corporations and capital markets leads to deep distortions in the measurement of business performance and the culture of its people and services. Shaxson challenges the fundamental notion of ‘investment’ in modern finance, showing that what is really happening under its guise is the extraction of wealth, rather than its replenishment or wider distribution. In stark contrast, finance textbooks rarely mention the power and exploitation of finance or the concept of extraction, and celebrate tax avoidance and ‘optimisation’ as a means of profit maximisation. The book opens a serious fight with the very fundamentals of finance and its so-called expert institutions and cultures. The Finance Curse is a global call to action against this curse. In all, there are twelve chapters explaining the evidence behind Shaxson’s thesis, drawing from the history of the British empire and its thirst for wealth, power and dominance, to the deep support of the ‘City of London’ as a global financial centre attracting wealth and money flows from all over the world like a spider’s web. We should not forget that slaves were classified as property, and during the abolition of slavery, compensation was paid to the owners, not the former slaves. Shaxson journeys through the world of financial markets and capital flows, private equity and hedge funds, offshore islands and tax havens, money laundering and white-collar crime, exposing a whole network of deceit benefitting a few and robbing the many, without their consent or awareness. He charts the processes and effects of ‘financialisation’ which privileges finance and its providers over the makers and producers of things and services, turning finance into a master rather than a servant of the economy. 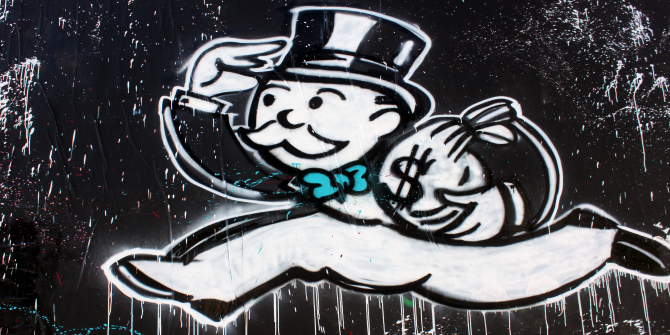 Narratives like success through profit-maximisation, free markets and market efficiency, fuelled by incentives for executives to maximise shareholder value at any cost, are shown to have a central role in shaping and growing inequality. They encourage and legitimise the robbing of nations and their public commons through tax avoidance, tax evasion and offshore tax havens and money-laundering. Shaxson devotes a whole chapter to ‘the evidence machine’, showing how influential think tanks are often corrupted by secretive funding and ideologies in their research, and that even government research is biased, politicised and rarely objective. He argues that just as economists used to treat the environment as an externality, much of corporate and financial evidence ignores the wider social and global impacts of financial markets and institutions and offshore money laundering. In accounting, all the UK auditors involved in policing the banks prior to the crash have experienced huge growth after it, yet have faced no fines or imprisonment. When a large corporation announces increasing profits and growth, the methods of achieving this, and the wider social and environmental impacts, are rarely exposed or critically discussed. There are many corporate stories of such aggressive behaviour in our news today from top-performing companies, like Facebook, Apple, Google or Amazon. As an academic concerned about social justice and fair ethical finance, I feel that against this tide of greed and profit maximisation, I am naïve in expecting a better, honest, reflective and fair finance. In my work on the Jains, one of the oldest living cultures of the world, I tried to show what a sustainable finance can look like, drawing from timeless ancient practices and wisdom. In the exposé of the largest bank failure in British history (HBOS), I discovered how corrupt financialised culture destroyed 350 years of prudent history and heritage in just seven years, in front of the eyes and ears of stock markets, auditors and regulators. When I explored the growth of accounting and finance education worldwide and its impact, I charted the urgent need for fundamental change in the very theories and science that are taught, given the challenges of global warming and vast social and economic inequality. Universities today have become very big financial engines themselves, with business, accounting and finance education often at the core of their money machines. Their administrative overheads and growth aspirations can force them not to challenge the DNA of business and finance at a critical time in world history when we need public intellectuals like never before. Education itself has become ‘financialised’ and commercial, and expertise is being competitively self-policed by global journal rankings and conservative peer reviews. As a result, engagement with public issues has been culturally silenced. In the league of international business journals, the Americans lead the tables, so the paradigms have become intellectually colonised. The latest public evidence of the auditing and regulatory crises among the Big 4 global accounting firms (EY, KPMG, PWC and Deloitte), especially in Britain, shows how expert consultants are using the badge of ‘professionalism’ to disguise and facilitate corporate exploitation and expropriation on a vast scale. Richard Brooks’s book Beancounters is a parallel exposé of the ‘finance curse’ behind the trenches of the activities of these accounting giants and should ideally be read alongside this book. The implications of both texts are the need for a significant and fundamental reform of business, accounting and finance education, and an overhaul of the theories that are taught in the classroom in the name of science. Through Shaxson’s journalistic, investigative and analytical mind, he holds a mirror up to us, exposing big data sets, offshore networks and the hidden extraction engines of private equity and hedge funds. He helps us broaden our minds to the subtle webs and cultural and materialistic engines which undermine liberal principles of freedom, democracy, fairness and equality. If experts choose to ignore them for the sake of their personal careers and promotions, then they will be betraying current and future generations from understanding truth and building a more equal, just world. The power and greed of banks and financial institutions need to be strongly regulated to protect the public interest, and ensure equality of opportunity and wealth distribution. Atul K. Shah is a Visiting Professor at City University, and an expert on Ethical Finance and author of several books on financial crises and education reforms.